What excites us about verbatim is, firstly, the way its documentary style and realistic theatricality can transport an audience to the exact moment of an event, situation or conversation. Secondly, its ability to engage with communities and raise real people's voices to the stage. We have a fascination with the real and what it is like to live in the modern world. We work collaboratively - devising, directing and producing our own work. 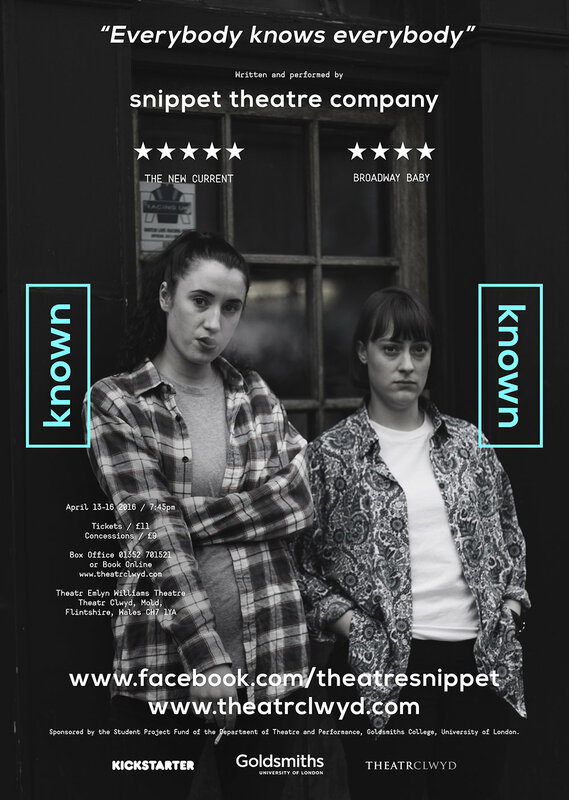 Our debut play was ‘Known’, a verbatim play about the small town community of Porthmadog, North Wales. It explored how that community reacted to and rebuilt after a young woman at the centre of the Porthmadog community was found dead one night in 2010. From 2013-2015, Snippet carried out interviews with the local people of Porthmadog to create ‘Known’. Whilst not seeking to answer the questions of what happened that night, 'Known' is a delicate and often witty exploration of a community learning to rebuild after a devastating tragedy. Our second show was 'Mood Kill', which we have just presented at the Camden Fringe and The White Bear. It is a piece about male mental health, specifically focussing on depression and suicide. We collected material for about two years, showcasing the real stories and experiences of men who have survived suicide attempts, bereaved families and friends, and men who are opening up and confronting their mental health for the first time. 'Mood Kill' is a delicate, sensitive and, at times, confronting exploration of what life is like for those living with this on a daily basis. We are currently developing a show about gender, gender identity and expression. We are aiming to make a show that celebrates all expressions of gender and interrogates the social stigma that surrounds unapologetic expressions of gender that do not conform to social 'norms'. We want to hear your stories, so if you have anything to say about gender, or would like us to follow your journey, please get in touch using the link below.